Even as the housing market continues to improve -- sales of existing homes in May increased to their highest pace in six years, the National Association of Realtors reported on Monday, and first-timers make up 32 percent of the buyers -- it is leaving millions of Americans unwillingly stuck in rental housing, the New York Times reported yesterday. The nation's homeownership rate has been falling for eight years, down to 63.7 percent in the first quarter of this year from a peak of over 69 percent in 2004, according to a new report released yesterday by Harvard University's Joint Center for Housing Studies. The flip side of the decline in homeownership is a boom in rentals and a significant rise in the cost of renting. On average, the number of new rental households has increased by 770,000 annually since 2004, the center's report said, making 2004-14 the strongest 10-year stretch of rental growth since the late 1980s. Read more. The House Financial Services Committee has investigated serious allegations of discrimination and retaliation against employees at the Consumer Financial Protection Bureau, and today it held a hearing to examine those allegations, HousingWire.com reported. "The level of unprofessional treatment and dysfunction that I have observed and endured has not only hurt me, but has hurt countless CFPB employees who would naturally look to an Office of Civil Rights for protection against discrimination," according to the prepared testimony of Florine Williams, a career professional with over 20 years of Equal Employment Opportunity experience who currently serves as a senior equal employment specialist in the Office of Civil Rights at the CFPB. Another witness, Robert Cauldwell, a CFPB examiner who currently serves as president of the National Treasury Employees Union Chapter 335 (which represents CFPB employees), said he has observed widespread problems at the CFPB. "When employees file complaints, the CFPB reaches into their past to dig up irrelevant information and use it against them," Cauldwell testified. Read more. Click here to read the prepared hearing testimony. MISS ABI’S TELECONFERENCES EXAMINING SUPREME COURT RULINGS IN BANKRUPTCY CASES? ARCHIVE REPLAYS AVAILABLE IN THE NEWSROOM! - Baker Botts, LLP v. ASARCO, LLC on June 18. Click here to listen. - Consumer Case Round-Up on June 3 (Bullard v. Hyde Park Savings Bank, Harris v. Viegelahn and Bank of America v. Caulkett and Bank of America v. Toledo-Cardona). Click here to listen. - Wellness International Network, Limited v. Sharif on May 26. Click here to listen. 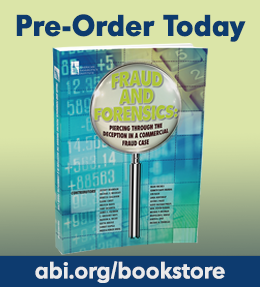 NEW FRAUD AND FORENSICS BOOK AVAILABLE FOR PRE-ORDER IN ABI'S BOOKSTORE! Now available for pre-order in the ABI Bookstore is Fraud and Forensics: Piercing Through the Deception in a Commercial Fraud Case. Cases such Madoff and Enron have hinged on the ability of talented investigators to uncover the truth amidst layers of fraud, and this book highlights the areas of specialty, challenge and reward for forensic accountants and the professionals who work with them in commercial fraud cases. Written by members of ABI's Commercial Fraud Committee among other noted professionals, Fraud and Forensics provides a broad and deep look at the challenges faced in the course of a commercial fraud matter, as well as the tools available to help identify, unwind and prove fraudulent transactions. This book will also assist both forensic accountants and the professionals who work with them to sift through the fine details while creatively considering all of the possibilities to fit together the pieces of a fraud puzzle. Click here to pre-order. (Book to be shipped in mid- to late July; make sure to log in to obtain the ABI member price). 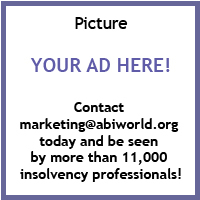 Don't miss the abiLIVE webinar on July 8 examining the Chapter 11 Reform Commission's recommendations on professional fees and expenses. The panel will discuss the recommended reforms that provide for more effective oversight, as well as alternative fee structures consistent with professionals’ ethical obligations under the Code of Professional Responsibility. Click here to register. The 2015 Bankruptcy Judges Roundtable, an ABI Workshop, will take place at ABI headquarters on Aug. 4 to examine the Chapter 11 Reform Commission's recommendations on resolving court splits. The Commission identified more than 30 splits in case law on important bankruptcy issues. Attend the program from 3:00-4:30 p.m. ET in person or via live webstream to hear five bankruptcy judges discuss the recommendations and issues surrounding the court splits. Speakers on the program are Bankruptcy Judges Dennis R. Dow (D. Mo. ), Bruce A. Harwood (D. N.H.), Barbara J. Houser (N.D. Texas), C. Ray Mullins (N.D. Ga.) and Eugene R. Wedoff (N.D. Ill.). ABI will seek 1.5 hours of general CLE credit in 60-minute-hour states and 1.5 hours of credit in 50-minute-hour states for the program. A networking reception will follow from 5-7 p.m. 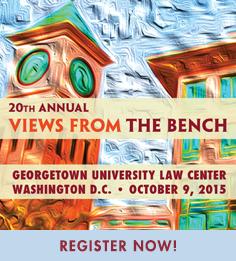 ET for in-person attendees, and registration for just the reception is also available. Click here to register. The Ninth Circuit affirmed the BAP's ruling that the debtor's exemption claim under California's homestead exemption laws does not apply to the debtor when (1) the debtor did not reside in the property for purposes of a homestead exemption, and (2) the California exemption law asserted only applies to voluntary sales and not forced sales such as the filing of the bankruptcy petition. Alternatively, the Ninth Circuit upheld the BAP's ruling that Florida exemption laws do not apply notwithstanding that the subject property is located in Florida because the debtor was a resident of California for purposes of Sect. 522. There are more than 1,700 appellate opinions summarized on Volo, and summaries typically appear within 24 hours of the ruling. Click here regularly to view the latest case summaries on ABI's Volo website. A recent blog post analyzes the recommendations of ABI’s Commission to Study the Reform Commission for plan settlements and compromises. For more on the Final Report of the Chapter 11 Reform Commission, please click here. INSOL International is a worldwide federation of national associations for accountants and lawyers who specialize in turnaround and insolvency. There are currently 23 member associations worldwide with more than 9,800 professionals participating as members of INSOL International. As a member association of INSOL, ABI's members receive a discounted subscription rate. See ABI's enrollment page for details. "Ethics - Chapter 11 Commission Recommendations on Professional Fees and Expenses"
- abiLIVE Webinar: "Ethics - Chapter 11 Commission Recommendations on Professional Fees and Expenses"
Aug. 4, 2015 | Alexandria, Va.
Sept. 10-12, 2015 | Las Vegas, Nev.
Sept. 16-17, 2015 | New York, N.Y.
Oct. 9, 2015 | Washington, D.C.
Oct. 12, 2015 | Chicago, Ill.
Oct. 15-16, 2015 | Kansas City, Mo.